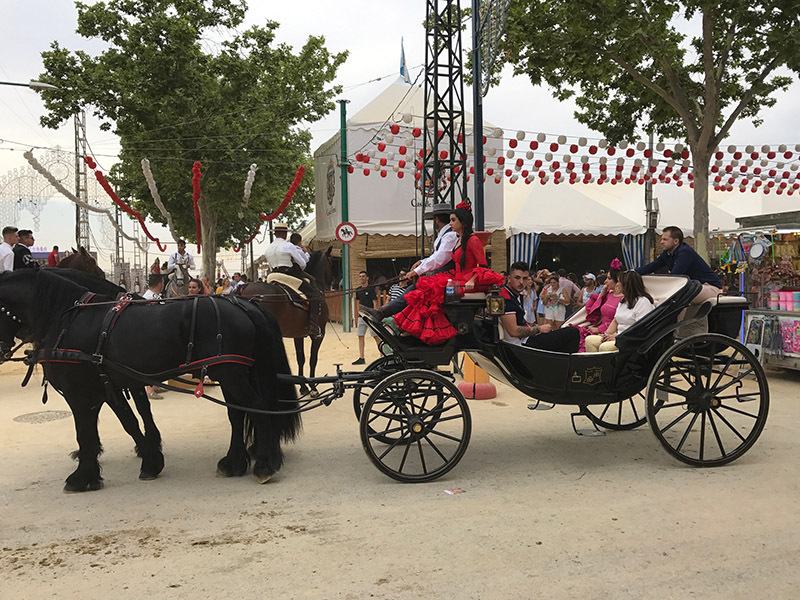 One of the festivals that we really wanted to witness, when we were planning this year in Spain, was the Feria. 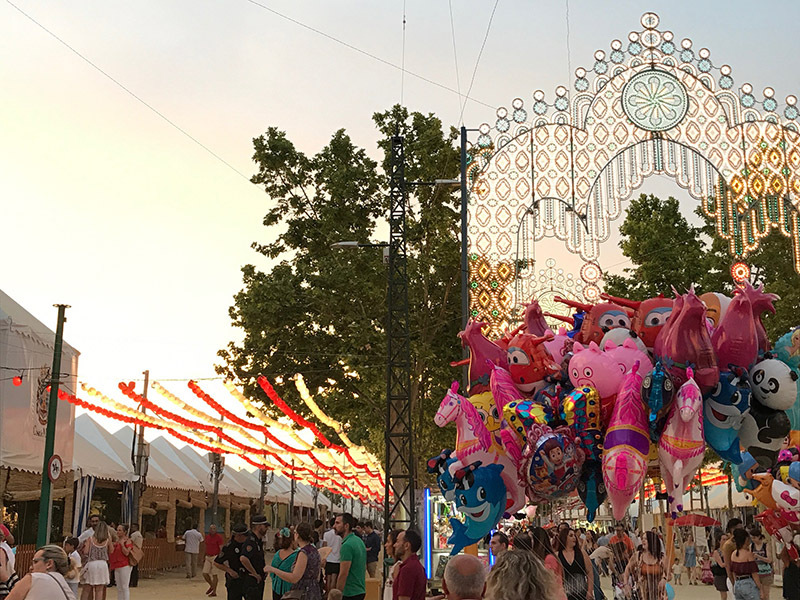 Sevilla has a particularly famous such festival, usually in April and called, appropriately enough, La Feria de abríl, but Granada has its own very special festival that ties in with one of the main religious festivals in Spain, Corpus Christi. Corpus Christi, or the festival of the presence of the Body of Christ in the Holy Water, is a very big deal in Granada, and in the 17th Century someone decided to extend this festival beyond the one day by adding an ‘eve’, and gradually the combining of the religious ceremonies and a fiesta grew into the week long celebration that exists today. How best to describe these two simultaneous events, as they are very different even though they run concurrently. The week of Corpus Christ in Granada City Centre is a fairly refined affair, with dignity, class and such an atmosphere. This year, Corpus Christi week ran from 10th - 17th June, although Corpus Christi fell on 15th June. Granada is transformed into one large event and party venue. Across the city, live music, dance, theatre, exhibitions all take place in some of the centre’s most beautiful locations. Processions highlight the religious significance, and Spanish people and foreign visitors mingle in a parade of grace, style and immense bonhomie. I can honestly say that just as I thought I could not love Granada any more than I do, Corpus Christ came along and gave every emotion a massive boost. It is a beautiful city, made more stunning by the people who come together to mark this special occasion. We were unable to attend every event on every day - indeed, given the high temperatures this week, that would have been well nigh impossible! We went in to the City centre a couple of times, and were amazed at how calm and tranquil the whole affair was. The patio in the City Hall was open to all, with free exhibitions by local artesans, and on a stage along one of the cloisters there were frequent concerts given by musicians and dancers, all free and never over crowded. It is worth mentioning that, with all the events we attended, there was never a feeling of overcrowding, safety fears or disorganisation. 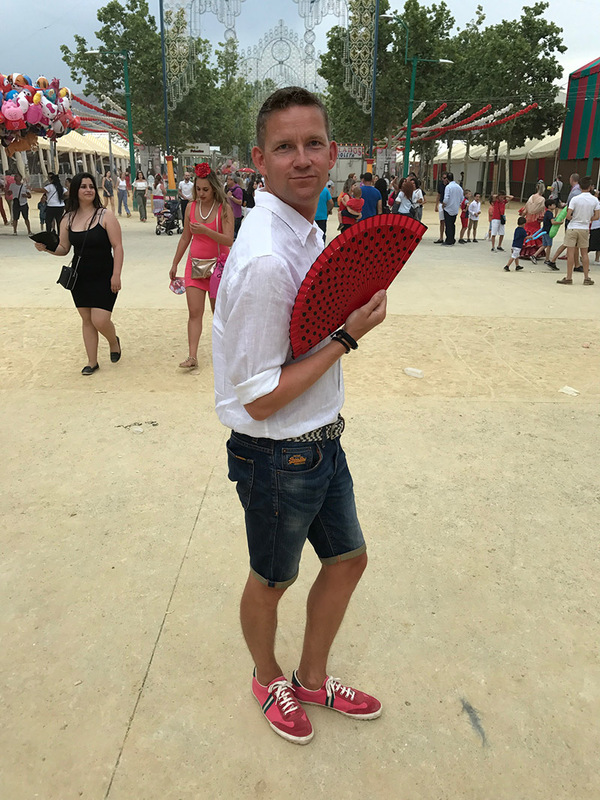 This is a festival that has evolved over the centuries and is so well established and set in its ways, it is almost a matter of course, provided by people who are generous and warm-hearted for people who love the culture of Andalucia. We watched a couple of dance performances in the magical setting of Plaza Bib Rambla, including a series of Flamenco performances given by a dance school, with some of the more enchanting dancers being aged around 8 or 9 years of age, all strutting their stuff with real attitude and lots of duende, much to the delight of the audience. Equally fascinating was the protocol of the audience. Folding chairs were set out for the audience to use, all free of charge, and as the evening progressed, people came and went. The doughty older women of the neighbourhood have obviously become well-versed in the ways in which to get a seat, and when some audience members decide to take their leave of the performance, there is a rush of lacquered hair and smart dresses to get to the vacant seats first, and god help anyone who gets in the way. I have never seen such dogged determination. Restaurants were not full, bars were uncrowded, streets had the animation provided by people out for a good time, but none of the crowds and herding that had become such a part of London events. One afternoon, in the square outside the City Hall, a band was playing and people of all ages were dancing, arm in arm, in the sunshine - a charming tea dance oozing with goodwill. On the Saturday night of this week, we went into town late to grab a drink and some tapas, pop into the City Hall patio and watch some dance in Plaza Bib Rambla, before making our way down to the large area outside the Palacio de Congresos. Everything was so seamless! We got to the Palacio de Congresos at around 11:15pm to see the tail end of a concert provided by 4 district brass and woodwind bands, and heard some amazingly dramatic music under the stars and in temperatures still topping 30 degrees. We sat on the steps of the Congress Hall, with glimpses of the illuminated Alhambra behind us, and the stage in front. At midnight, the concert was over and the pyrotechnics began, and what a display it was. We felt as if we were part of a special invitation-only audience, and after 15 minutes the audience started to disperse, calmly filtering off to bars and restaurants to continue with the night. We nipped down the stairs and into the car park below to get our car, and drove out of the city in the space of 5 minutes - no traffic, no crowds; all as if the event had never taken place. La Féria that runs alongside Corpus Christi is equally splendid, but quite different. 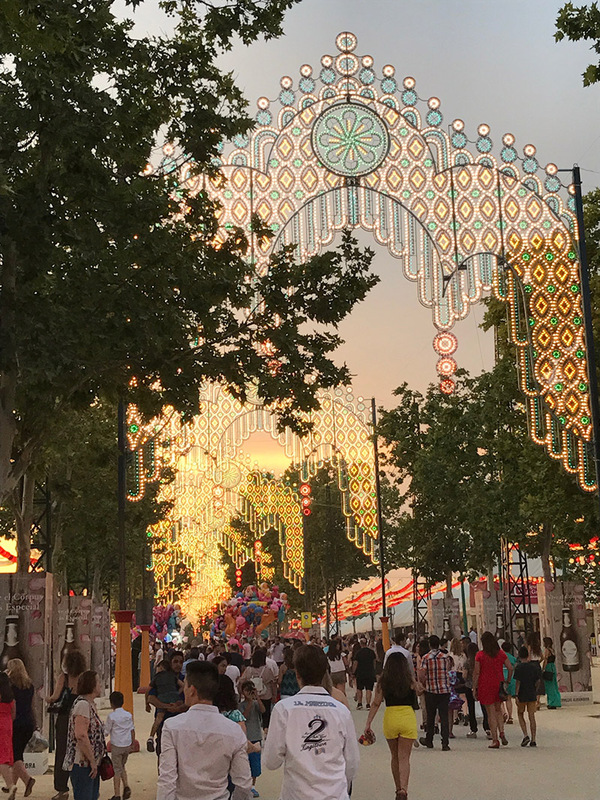 Although there is a slight crossover between the two, in that people pass frequently from the city centre to the main fairground on the edge of town, the atmosphere could not be more different. The common link is that everyone is here just to have a good time. How best to describe the Féria? We had difficulty, as when we arrived we were so overwhelmed by the sights, sounds, variety, colour and size of the fiesta that we were, for once, slightly lost for words. As a start, the Féria is a little like the best wedding that you will ever attend, the best family party, the best christening, a game, agricultural or country fair, a classy summer horse-racing meet at somewhere like Newmarket’s July Racecourse, and a nightclub, all rolled into one! 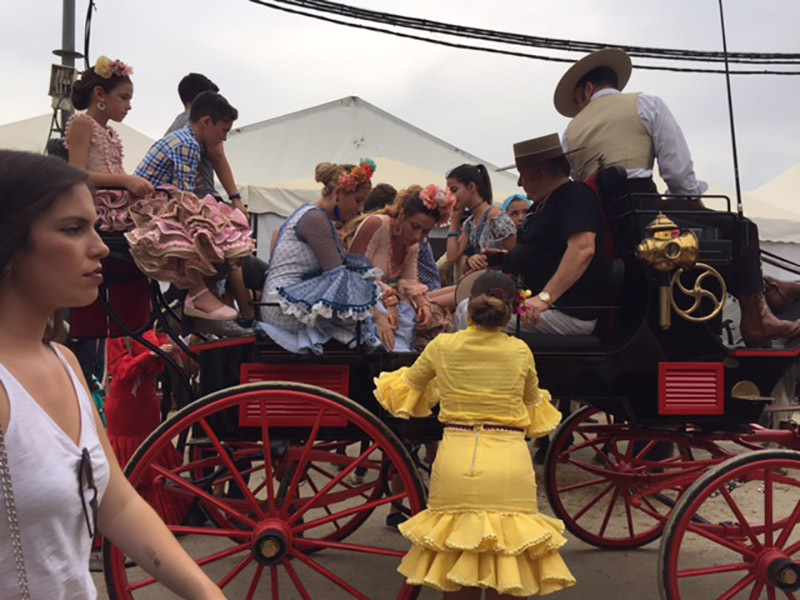 This is the event when all the Spanish ladies don their magnificently bright, fully-frilled dresses and parade, flowers in their hair, abanicos in hand, past the many Casetas selling drinks and food. During the day, beautiful horses strut around the ground, and on their backs sit the smartest and most elegant men (of all ages) you are likely to see. Tight trousers, bolero jackets and broad-rimmed hats create a fine silhouette, and these men know it. Horse drawn carriages skitter past, and the Caballeros line up outside bars for a quick drink, reminiscent of scenes from old Western films, but with style and elegance thrown in. 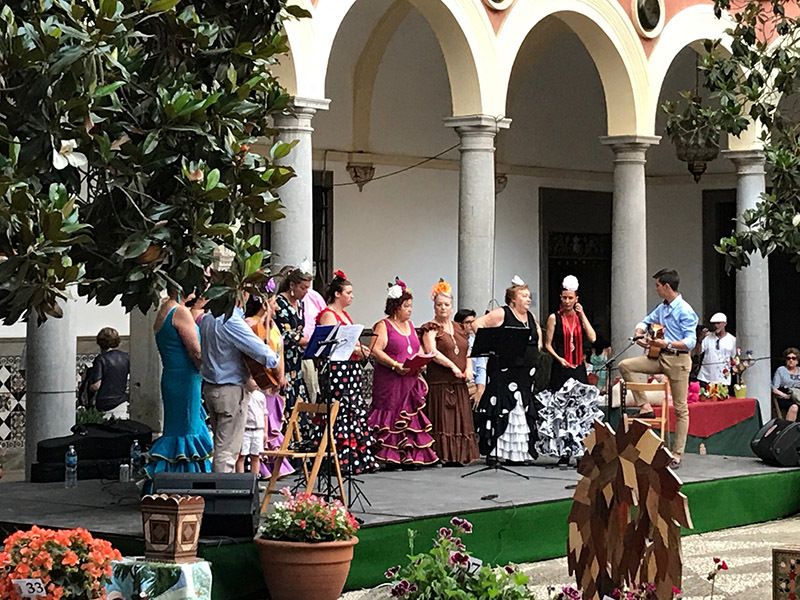 Each Caseta offers, as mentioned above, food and drink, but also their own style of music, be it live or recorded, and spontaneously the people of Granada dance - flamenco, Sevillanas, or anything else that goes. There are no inhibitions here, in the same way there are never any signs that people might ever contemplate going home to bed! Along one edge of the fairground, there is (hardly unsurprisingly) a fun fair. We met up with one of our Spanish friends from Granada, and a group of her students from our language school. The students had a slightly glazed look, as if this whole crazy spectacle was just too much to absorb after a day of learning Spanish. Our teachers, however, know the score, and we trotted (together and separately) from one dance floor to another. Andrew and I ended up in a bar with a rather fabulous DJ who was mixing his own versions of traditional Spanish dances, the words to which were all known by the ecstatic dancers and admirers. Whole families were here - couples in their 80s walking arm in arm, mums and dads with babies in buggies, teenagers with no attitude. Posters outside every Caseta made it clear that everyone was welcome here; discrimination, as a word, might as well not exist here. Never have I felt so included or such a part of this community of lovely people. Whilst waiting outside the main gate for our friends to arrive, I was greeted by our delightful butcher! I had difficulty recognising her, as she was not behind her counter in the Granada Market hacking at chuletas de cordero for me, but she knew me, and made it known. Conchita (for that is her name), rest assured I will be back for sausages soon…. You can probably tell that this week-long festival surpassed our expectations. We had a hangover and dusty shoes the day after the Feria, but these were tiny (minuscule) penalties to pay!